Blessings to all on this beautiful Michaelmas Day! And so the dragon was slayed ... or perhaps it is slain, I'm not sure. Either way, his number is up! So we have a very full and festive week ahead! There's Michaelmas on Monday (today), St. Therese on Wednesday (and October begins! ), The Feast of the Holy (Guardian) Angels on Thursday and St. Francis, our family's patron saint, on Saturday. Plus we have our homeschool group's annual apple picking trip this week, too - weather permitting. And so far the weather looks to be fairly seasonal this week. High 60s and party sunny skies. Lovely, lovely! I'm a bit under the weather at the moment (a bit on that below) so all my plans are in limbo till I'm back up to speed. But I have some special foods and activities planned for the boys ... I love this week in our Catholic calendar because there's so much to do with the children. Do you have any traditions for this time of year? October really is such a wonderful month! How do you gently (and comfortably) wean a nursing toddler? He takes bottles and cups easily but he still wants his "Na" on the regular. (A few times a day.) I never nursed this long with my other boys so I'm at a bit of a loss. Any thoughts and suggestions are welcome! Well my friends, I'm wishing you all a happy week ahead - thanks for stopping by and see you here again soon! EB did ... ok. We got thought it, he got through it. We arrived early for our 4 p.m. appointment ... and they took us late (as many of you with special needs kids know, this is a recipe for disaster). And it did make things more challenging, but with all hands on deck, we got EB through it. All of the brothers were with us (we picked Bookworm up at BC on the way in) and my mum was with us as well. Plenty of helpful hands, caring hearts and extra eyes surrounded us, giving Bill and I a much needed boost and the time we needed to meet with the doctors. Bottom line - Earlybird's MRI was fine and his EEG was mostly normal. He does have what they called, "spikes" indicating/validating the need in his situation for medication (to keep the seizures at bay). No real explanation for why he has seizures however, all his structures were normal and healthy. And Thank God for that, really. As for his medication, they adjusted his dosage a bit and added more vitamin B6 to help with the side effects. We left with some good information and a game plan, and that's enough for now. We'll see how things go from here and return for another appointment (Heaven help us, lol) in August. Now, a quick word about Monday's Kitchen Chat - I apologize that I kind of dropped the ball on KC this week. I was going to do "Cookbooks" next, and ask for your pictures (where you store them, ones you love) but obviously it's too late now. How about next week, instead? 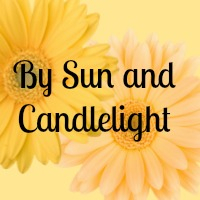 Start sending those pictures in, if you have them (bysunandcandlelight AT comcast DOT net) and we'll dive in on Easter Monday (4/21). Then how about for this Monday we talk about "Easter in the Kitchen?" Holiday entertaining, preparing foods, coloring eggs, creating special treats for our families ... childhood favorites and fond memories, etc. And if you don't celebrate Easter I'd still love to hear about your Springtime celebrations just the same - it's a wonderful time of year to freshen our kitchens and celebrate the return of light and life to the heart of our home! Blessings on your evening, my friends .... see you here again very soon! p.s. Anyone know what kind of flower that is above? They're popping up all over our front yard! 1. Earlybird did very well yesterday wearing the ambulatory eeg - he only fiddled with the contraption once (the itching was driving him crazy!) but we were able to get it all back in place, using gauze and tape we had at home. The hospital visit was quick - they used dissolvable glue so it all just washed off. He's not a fan of head washing - or hair cuts for that matter - so it was a little rough on him - but, thankfully, quick! So now we wait for results, and a follow-up with the neurologist next month. We're greatly relieved to have this behind us ... I honestly felt an eeg might be beyond our reach. I hope and pray this gives the doctors information that will ultimately help them help Earlybird. Speaking of help, we are grateful to my mum who once again made the situation so much better not just for EB, but for all of us ... and to our friend, Laura, who helped get our Crackerjack home from his afternoon class. And of course, to everyone here who shared prayers and kind words - thank you, thank you, so much. I'll keep you all posted on EB's journey. 3. 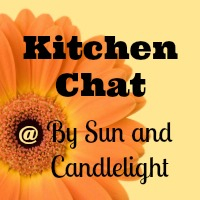 Now, if you look over on the righthand side of my blog you will notice a sunny little "sign" for my "Kitchen Chat" series. Divina made that up for me, isn't it lovely? And wasn't that kind? If you click on that button it will take you directly to the Kitchen Chat archive ... and I'm thinking this will run longer than 4 weeks. There's so much to discuss! Even once we re-start Masterpiece Mondays, there's room for both posts, I think! Next week's topic (3/10) will be: Menu Planning. That seems to be another hugely popular topic. So if you'd like to join the conversation, please jump into the comments! (First post on Seasonal Eating is here.) And if you have a blog yourself and would like to link in, feel free to grab the button and share your thoughts in a post at your blog. We'll have lots of fun! 4. Lastly, how sweet are these? A Peter Rabbit cupcake decorating kit - a real "find" at HomeGoods last week. Perfect for Easter of course, but I may save them for Little Bear's 1st birthday in May. That would be a darling party theme, don't you think? Well, so far so good! Good morning, my friends ... I'm checking in quickly to report that all is going well so far with Earlybird's ambulatory EEG! We're halfway there! Thank you all so, SO much for your prayers and support. You cannot know the comfort and strength they have given me. When we were safely back in the car yesterday, EB was all set, and I felt like I could finally breathe ... my thoughts went to you all and your prayers on our behalf. I KNOW they made the difference, and I appreciate it so much. My hope this season is to give more of myself every day and to serve my family as they need ... that I need less for me, so I have more to offer them ... and that, in all my words and actions, I express my love for, and deep gratitude to God. Blessings on your day, my friends ... thank you for listening, and caring ... I'll be in touch again very soon. I am trying very hard to stay positive and not "stew" in my worry, but I'm having a hard time seeing how this will work. I am hoping that he will be able to withstand it all - we're asking a lot of our sensory-challenged boy! And right now I'm praying we find the strength and patience to guide him through it as smoothly as possible. I need to find words and actions that will soothe and support. I need to maintain an energy that is loving and firm. I need to keep my wits about me and remember that, above all, I am this child's mother, and I know him better than anyone. All this to say ... I'd be so grateful if you would keep our EB in your prayers tomorrow ... it will be a tough day for us all, and I might not get on here for a bit. But I will post an update just as soon as I can. Thank you, my friends ... blessings to you and your loved ones ... I'll see you here again very soon. ... sleep is the best medicine. Still fighting our way back to normalcy around here ... just wanted to let you all know the boys are getting better everyday. Little Bear is a very lucky boy to have big brothers who not only love him so much, but who are around a lot, and therefore really know him. What he's like, what he likes ... how to soothe him when he's feeling under the weather and Mama has run out of hands. This is a blessing to Little Bear's mama in ways both practical and profound. My friends, a nasty cold virus has invaded our home and so things are not "running on the regular" right now. Nights are particularly tough, meaning there's not so much sleeping happening as "cat napping." All this to say, I'm taking a few days off to nurse my family back to health ... but I will be return just as soon as I can ... and I do hope all of you are staying well - and safe with all that crazy weather! My friends, I could use some advice on baby sleep - or specifically, getting my baby to sleep better at night. Has anyone had an older baby revert back to constant waking through the night? And if so, how did you handle it? When Little Bear wakes, he's usually only awake for 10 minutes or so before he conks back out. First I'll try to just soothe him without picking him up - humming softly, giving him his binky and resting my hand on his chest. On rare occasion this works and I can slink off back to bed. More often than not he starts to fuss - really fuss after a few moments - and I end up picking him up to soothe him in a more active way. This is usually through nursing, though sometimes I can rock him back to sleep on my shoulder. So then I'll put him back in his crib, he's (seemingly) sound asleep, but he's awake again in the same manner within the hour or perhaps after 1.5-2 hrs. if I'm lucky. If I've been getting up a lot with him before midnight (as in the case last night) Bill will get up with him and perhaps give him a bottle so I can get a little more rest. We're trying to work on putting him down for naps (and eventualy bed for the night) before he's fully asleep because we think possibly he's waking confused - he was just in our arms and now he's alone in his crib so he fusses for us. It's hard to do that though, because he's not a fan of soothing himself to sleep! Also, his crib is still in our bedroom because he's waking so often it's a more convenient position, but it's possible his sleep is being disrupted by our sleeping sounds. So we are also working on getting the nursery cleaned up and ready for his crib (and him)! Aside from the sleep issue, Little Bear is truly the easiest baby, and I'm very pleased to say I've nursed him longer than I've ever nursed before! At first I worried maybe my milk wasn't filling him enough, but he's gained weight on track and as I mentioned above, is eating well otherwise. Thanks so much in advance, and have yourselves a very nice day! It was a tough day - a loong day - but he did well. We spent several hours at Children's Hospital in Boston (I wish everyone had this hospital local to them) and both EB and Little Bear (who tagged along of course) were as good as gold. EB was sedated for this exam and once he was "awake enough" in recovery, we were allowed to take him home. He was cranky for sure, but as we left, each and every doctor/nurse's station we passed got a "Thank you, doctors!" from EB. :) The ride home was long and he threw up a couple of times, but he seemed to relax once we were home. We will talk to the radiologist tomorrow but so far the MRI showed "no abnormalities that would indicate a seizure disorder." There does seem to be an issue with his corpus callosum, which may actually shed some light on his challenges ... we'll learn more in a follow-up appointment. Bottom line: Earlybird's ok, we're home and it's over! And I'm so glad to have this day behind us. Thank you again for all your support ... reading all your messages - knowing so many dear people were thinking of and praying for my Earlybird - it means so much, I just can't express it. But please know how grateful I am, deep in my heart. I will continue to keep you all posted, and of course, keep you all in my own prayers. A peaceful evening to you all ... see you here again very soon. So we've been consulting with Children's Hospital (via telephone) in preparation for Earlybird's MRI tomorrow. I've spoken at length with both a nurse and a behavioral therapist ... now I'm waiting to hear back from the anesthesiologist. The test itself is at noon Thursday (or thereabouts depending on wait-time). He can have nothing to eat after midnight tonight because he will be sedated for the exam, and that might be our greatest challenge - he'll be pretty cranky about that! Funnily enough, EB is all talk this week of "going back to Disney" and so we've been looking at pictures from our trip. I especially love this picture of the two of us (though I'm not generally fond of pictures of my backside, lol). It was taken on our last day in the park after we had just spied an alligator floating by the edge of a pond. What an amazing sight to see! We were torn between curiosity, excitement and fear! But Earlybird got nervous, so he and I left Bill and big brothers behind and walked back to "safety" (i.e. the golf cart) - hand-in-hand, talking it out the whole way. My friends, to be honest, I'm nervous. But I'm trying very hard to stay positive, to let go of my worry and be the center of peace and support EB needs me to be. Any prayers and/or good thoughts you can offer on our son's behalf would be deeply appreciated! I''ll let you all know how it goes ... but for now, thank you so much, and have a good day ... see you here again very soon! We'll of course keep you all posted and I would like to once again thank you all for your encouragement. I know our spirits are held up by all of those keeping us close in their hearts and prayers. Even though this was a disappointing and exhausting day, we are grateful for our support system and extremely thankful for our Earlybird. We saw many children today whose parents bear a much greater load than we do ... EB has his challenges to be sure, but he is (we are) blessed in many, many ways. Thanks so much for checking in ... I'll be back in touch very soon. * Note: Before I go, may I press upon you all again for more prayers for Earlybird? He had another seizure at four this morning ... another very scary ordeal for our son (and his parents). Thankfully, this seizure was shorter than the last, and because we were told how to handle it, there was a bit less panic on our parts. Still doesn't take away the worry, or the distress of our son who just has no idea why this is happening. God bless him, he asked if he could go back to "the hotel" this morning once things had calmed down (and he was back to himself). I asked him if he meant "the hospital" and he did. He remembered the kind care he received and that he felt better once he was done. * Next day update (because it's taking me that long to get this post up! ): After a call from the neurologist last night, we brought EB into Children's Hospital to start meds. Bill and my folks drove him in around 6 p.m (so I could stay home with the baby and Crackerjack); they were finally back home around midnight. So today starts a new reality of twice-daily medication, and watching to see how he reacts to it. They warned us it could cause some physical and behavioral issues, but we'll just have to wait and watch and hope (pray) for the best. You know ... I guess sometimes we have to "take" joy and peace when and where we can find it, even when there's all this other stuff going on and life is far from quiet or easy or perfect. When we do find it - the joy and/or the peace - we have to enjoy it in that moment, and tuck it away to remember later. We never know how much we might need it. I really don't mean to sound preachy, because this is something I am working on very much for myself. Keeping my eyes and heart open to the goodness in life around me and remembering that our blessings outweigh our challenges. Ok, I'm going to wrap up because I've kept you all long enough. My friends, thank you so much for your continued prayers and support. I will update as I can ... and I will post here as often as I can. It might not be every day as I planned, but I will as I find the time and opportunity. Hope you all have a nice day ... see you here again very soon. Our First Week: A Bit of a Bust! Yes, to be perfectly honest, our first week was pretty much a flop, lol. So ... Crackerjack missed all his first week classes (he's taking Biology, Art and American History outside the home) and aside from a few light assignments and missed homework he just tried to rest and get better. I asked nothing of EB after Wednesday, and once LB and I got sick on Thursday, I just called the week done. Our homeschool motto on proud display in the breakfast nook. I drank a lot of tea last week! In the living room (our someday "library" once we get more bookcases up), we have some comfy seating and a whole coffee-table full of Mama's magazines. Earlybird and I looked at a book called Autumn: An Alphabet Acrostic. So there's a little look around the house this past week ... I am hoping to get back on track and I will report back in just as soon as I can. In the meantime, have yourselves a good Monday - a very cool and gray day in our corner of the world - and I will see you here again sometime soon!